Costume Discounters, online at CostumeDiscounters, offers one of the widest online selections of costumes and accessories for all members of the family. At Costume Discounters, you can find costumes inspired by the 20's, 50's, 60's, 70's, and 80's. There are also holiday costumes on sale including: Mardi Gras, St. Patrick's Day, Thanksgiving, Valentine's Day, and Christmas at Costume Discounters. You can buy Stay Puft Inflatables, Animated Walking Clowns, fog and lighting effects, and other props online at Costume Discounters as well. RetailSteal.com has the best Costume Discounters coupon codes, Costume Discounters discounts, Costume Discounters coupons, and Costume Discounters promo codes. Shipping and handling rates at Costume Discounters depend on the pricing of your purchase and your shipping destination. Free shipping is offered for orders over $70. See website for full details. Some exclusions may apply. 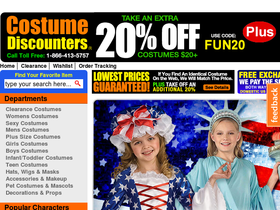 Save $20 on your purchase from Costume Discounters. Click and use coupon code with purchases $100+. Shop at Costume Discounters and enjoy 25% savings on orders $25+. Click here for code. Shop at Costume Discounters and enjoy 15% savings on orders $20+. Click here for code. At Costume Discounters, get free shipping when you spend $70 or more online. Click link to shop now. Shop at Costume Discounters and enjoy free US ground shipping on orders $50+. Click here for code. Shop at Costume Discounters and enjoy 50% savings on Easter Bunny Costumes. Click to shop. Shop at Costume Discounters and enjoy a huge selection of Summer Blockbuster Costumes. Click here to shop. Hurry over to Costumediscounters.com and save 10% discount on your total purchase with coupon code.